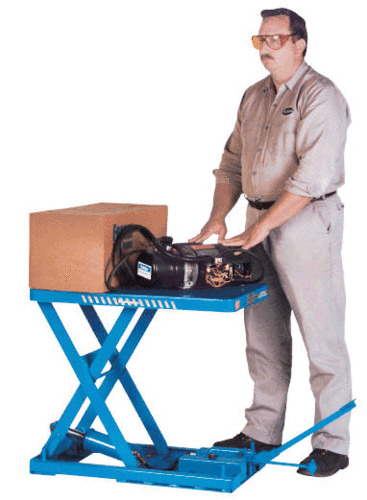 The Bishamon Compaclift™ X-Series Scissor Lift Tables are rugged, compact hydraulic lifts with capacities of 440 to 1,650 lbs., travel distance up to 45 in. and platform sizes from 18 x 25.5 to 20 x 40 inches. X Series CompacLift™ tables are most widely used in machine tool or other production line manufacturing activities requiring heavy-duty lifting and positioning within a confined area. With additional emphasis placed on ergonomics and the reduction of repetitive lifting activities. The X-Series meets an ever-growing need for lifting assistance. Basic design features a manual foot pump operation to afford the opportunity of economical solutions to lifting problems. Electric/Hydraulic and Air/Hydraulic units are also available in most capacities.